Where do I use my Topman voucher code? Topman is a great destination for men in search of cool attire for every occasion. With a selection of casual and formal fashion available, males of any age are able to kit their wardrobe out with the best pieces on the high street for affordable prices. Discover a variety of clothing including blazers, chinos, jeans, jumpers, loungewear, shirts, swimwear and even tuxedos at Topman. You can also find a selection of shoes and accessories such as brogues, boots, sunglasses, belts and bags. Not only do Topman sell a huge supply of their own brand clothing they also sell products from top names including Calvin Klein, Converse, Levi’s, Tommy Hilfiger, Vans and Champion. If you’re looking for a particular style you can shop via edit. The edits available at Topman include muscle fit, Topman X Stranger Things, embroidery trend, bestsellers and last chance to buy. You can also shop in the clearance section to find bargains and low-cost end of line products. As well as 'end of line' products there’s a great selection of new in items available online too, featuring new arrivals, the latest trends and new extended sizes. If you’re stuck for style inspiration you can always check out the Style and Stuff section on the Topman website which offers a variety of blog posts, editors picks and Topman presents videos for you to enjoy. If you’re struggling for fashion inspiration or need a bit of a push in the right direction when it comes to style, you can indulge in the personal shopping service at Topman. This service provides you with a team of veritable fashion pros to make your shopping experience more enjoyable and less stressful. The fashion experts at Topman will help tailor trends to your individual body, style and personality to ensure your wardrobe is on point and perfect for you. Discover the best bargains in modern menswear in the Topman sale. From bomber jackets to skinny jeans to cropped trousers - all the fashion pieces you need you’ll find here, and they're all discounted too. With sizes XS to XL and waist sizes of 28 to 34, no matter what size you are you can find bargain products that are both stylish and affordable. Shop by product type, style, fit and price and find great on-trend pieces for every season and occasion. You’ll find frequent sales at Topman as well as a constant clearance section that features products with discounts of over 50%. As well as big sales you can also enjoy multibuys at Topman too including 2 men’s t-shirts and vests for £12 and 3 pairs of men’s socks for £8. Whether you need a suit or stylish formal wear for a wedding, work, the races or prom you can find exactly what you’re looking for, in a perfect fit, at Topman. Browse through all the suits and tailoring available including suit jackets and trousers, three-piece suits, waistcoats, tuxedos, skinny and ultra skinny fit suits, slim fit suits and muscle fit suits. You can also shop through the Fine Tailoring By Charlie Casely-Hayford range, made from 100% Italian wool. This limited edition collection of premium suits fuses the timelessness and quality of Savile Row with the modern silhouettes of Topman to create stunning pieces that males of all ages can enjoy. You can return your order online, in-store or via the Parcel Shop for free within 28 days of receipt. 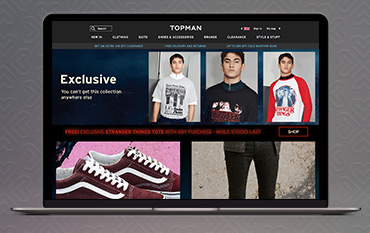 To find the store opening times of your nearest Topman use the Store Finder on the Topman website. We are constantly on the hunt for first order Promotion Codes for Topman to help you with your money saving. Our experts check dozens of sites for secret codes including NHS discounts, student sites & social media channels saving you time & money!